Stepping things up from our latest $1000 gaming PC build in which we included the excellent value for money gaming pair of the i5-8400 and new RTX 2060, this $1200 gaming PC build allows for slightly better parts pretty much across the board. The extra 200 bucks allows you to fit in a faster CPU, an aftermarket cooler, a slightly faster and better-cooled graphics card, a better motherboard, and slight better case. All these tweaks allow for an overall faster, better-looking, better-cooled custom gaming computer that's suited for smooth 1440p or high-end 1080p (144Hz) gaming in 2019 and over the next few years. We'll get to estimated frame rates for this 1200 dollar gaming PC build later on in this guide, but in a nutshell you can expect a flawless 60FPS in 1440p on high/ultra settings in most games, and in terms of 1080p 144Hz you can get some pretty nice frame rates in most games thanks to the strong 9600K (your CPU matters a lot if you want to achieve up near 144FPS for 144Hz monitors). With this $1200 PC build for Q2 2019 we've gone for a very nice, matching red and black theme that'll make for an impressive finished setup that you may stare at in awe for the first few weeks after building it. It's also overclocking-friendly with the unlocked i5-9600K processor and decent aftermarket CPU cooler to go along with it, plus an easy to overclock motherboard from MSI. We also list additional CPU cooler recommendations in this guide for those wanting to do more extreme overclocks. Although for those of you looking to save as much money as possible on your new system, our current recommended $1000 PC build is admittedly better overall value - IF you're only sticking to 1440p gaming on a 60-75Hz monitor (as all you need to get in that case is 60FPS - 75FPS for flawlessly smooth performance), and/or if you're 100% sure you won't be (and never will be) overclocking your CPU. But where this red and black $1200 gaming PC build shines, besides the tweaks and improvements I just mentioned, is for high end 1080p 144Hz gaming "on a budget". Here's the thing: if you want to completely guarantee you get a consistent 144FPS on high/ultra settings in the most demanding AAA games for a 144Hz display, you should invest in an i7 processor, and a stronger GPU than the 2060. However, this $1200 custom PC does indeed hold its own when it comes to 1080p 144Hz in many games, and you'll be getting some real high frame rates - not necessarily always 144FPS+ in the most demanding games on ultra settings, but in some games you will and in others you can either tone down the settings or accept that you'll get 100-144FPS etc (which still makes the experience smoother when compared to gaming at 60FPS on a 60Hz monitor for instance). Anyway, this setup can work well for either 1440p or 1080p 144Hz (or entry-level VR), and is sure to please if your budget is around 1200/1250 US dollars and you want maximum bang for your buck to strategically stretch gaming performance, cooling, reliability and looks for that amount. Time to cut the small talk and get into the actual details of the current best gaming PC build for $1200 (IMHO), and I hope this guide helps you in your research. Please note that links below may be affiliate links: clicking them earns me a small commission if you make a purchase and helps to support the site and the endless obsessive hours that goes into these continually updated in-depth guides. Thank guys. Confused? Above is the average expected performance of this parts-list at different resolutions and refresh-rates when playing a typical, graphically-demanding modern PC game on high/ultra/maxed settings. If you're not sure what refresh-rate your gaming monitor is, chances are it's a standard 60Hz screen. Learn more here: what is the best refresh rate for PC gaming. The average FPS (Frames Per Second) ratings are an aggregated estimation based on carefully studying multiple online benchmark sources. Note these are averages, meaning that in the most action-packed scenes the frame-rate will go lower. For example, if we list the Witcher 3 average as 50-60FPS, your FPS may drop to 30-40FPS in the most intense scenes, so take that into account in your build planning. Whilst we do everything we can to make these as accurate as possible, please note there's no guarantee you'll get this exact average as there are different factors that could affect your frame rate such as other hardware differences, software differences (OS, drivers, game patches/versions, etc), cooling/airflow of your build, enabled game features/settings such as Anti-Aliasing, different RAM setups you might be using, and so on. We always err on the side of being conservative with our numbers though, so we'll round things down if we need to instead of rounding up, so you can rest assured our averages are pretty safe bets in terms of what performance you can expect from a certain setup. As you can see, based on studying benchmarks for a parts-list of this calibre, our slick red and black gaming PC build will deliver excellent performance in 1440p resolution - even on maxed-out/ultra settings if that's how you like to roll (see are ultra settings worth the performance impact?). If you're gunning for 1080p resolution on a 144Hz monitor (this build is overkill for a standard 60Hz 1080p monitor), you're going to get a fair bit higher frame rates than the ones above, making this setup quite ideal for 1080p 144Hz as mentioned in the introduction to this guide. Whether you get 144FPS+ consistently is going to depend on the game and the settings, though. If you're building a gaming computer around/under 1200-1250 dollars right now in Q2 2019, the fastest gaming CPU you can squeeze in your budget - whilst maximizing your GPU choice first and foremost as that's the most important component of all - is Intel's i5-9600K. The 9600K is the latest 9th-gen i5 processor and improves slightly upon the previous-gen i5-8600K, and is an unlocked CPU meaning that it's ripe for some overclocking should you want to do so. However, you can still use it at stock speeds if you don't want to overclock. The closest competing chips from AMD would be the Ryzen 5 2600X and Ryzen 7 2700 which are currently priced a bit higher and a bit lower respectively compared to the i5-9600K, and so you could realistically fit either of those in a $1200 PC build instead if you wanted to (with a different motherboard of course). However, if gaming performance is your top priority, and especially if you're gaming in 144Hz where your CPU plays a crucial role in getting those high frame rates, our top suggestion is Intel and its i5-9600K. An i5 is a very capable gaming CPU that you could consider a "high end" CPU in terms of gaming, and is more than enough processing power for most gamers. You'd only need to get a powerhouse Intel i7 (or Ryzen 7) if you're a picky/serious gamer who is trying to get consistently super-high frame rates (144FPS+) in the most demanding games on ultra settings. See this i5-8600K vs i7-8700K benchmark as just one of endless examples where an i7 has proven to give diminishing returns in the majority of gaming contexts. Note that comparison is from the previous 8th gen processors, but it'll make no difference for the latest 9th gen (ie 9600K and 9700K) as these new gaming CPUs are the same albeit a tad faster. If you have more to spend than $1200, then by all means get an i7 (or Ryzen 7, which is better value for heavy multitasking) if you want the best of the best, but if you're looking to be as cost-effective and smart with your money as possible when building or upgrading your rig, which is what these recommended gaming PC builds are all about - an i5 is genuinely all the processing power you need to achieve flawless gaming in 1440p. For gaming at 1080p on a 144Hz monitor (as mentioned earlier this setup is overkill for 1080p on a 60Hz monitor), an i5 will perform very well in most games, with only the more demanding CPU-intensive games on the market requiring an i7 to get 144FPS+ consistently (in 1080p). But if you're gaming in 1440p, or even 4K, an i5-9600K is absolutely more than enough as it's all about the GPU for these higher resolutions. Plus, you're not going to get bottlenecked by an i5 in the majority of instances, and you could even pair it with a RTX 2070 (the graphics card up from the one in this build) and be totally fine. 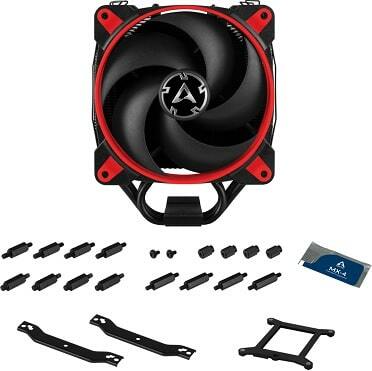 Note on Compatibility: All cooler recommendations above are compatible with the Rosewill Cullinan MX case, but if you choose the Silverstone RL06BR-PRO (one of our alternate case recommendations) be aware that the ONLY compatible cooler from the ones above is the Arctic Freezer 34 eSports Duo (in other words, the Noctua, be quiet, and all 3 Cooler Master's are NOT compatible with the Silverstone). When getting an unlocked "k" model Intel CPU such as the 9600K we've gone for, you NEED to buy a CPU cooler to go along with it as they don't come with one (for good reason as Intel's stock coolers are not too flash performance and looks-wise). For the current Q2 2019 1200 dollar build the all-new Freezer 34 eSports Duo fits our needs perfectly; both literally (physically), as it's more flexible in terms of being compatible with many more mid tower cases than other behemoth-sized coolers on the market, and performance-wise as it's been tested to be very competitive against more expensive models (see the reviews we've linked under "references" at the end of this build guide). To put it more simply; it's a great value choice if you'll either be keeping your 9600K at stock speeds, or even if you'll be doing mild to medium overclocking as well. 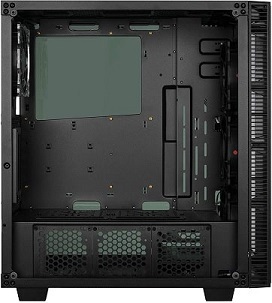 It also looks real slick, and the red model will look real classy with the red and black theme we have going on with this build, although check out the white, green, or yellow models if you're tweaking your hardware selections for a different colored theme. Truth is, you don't need a better, more expensive aftermarket cooler unless you'll be doing more significant overclocking of your i5, and a quality low-cost cooling solution like the Freezer 34 is adequate for most people. For enthusiasts among us who will be overclocking the 9600K beyond mild/medium levels, that's when investing in a higher quality air or liquid cooler makes sense, and we've listed some of our top recommendations above. One of the best bang for buck, top-performing and aesthetically-pleasing air coolers on the market, period. Whilst the NVidia vs AMD GPU debate is indeed a tough decision in lower price brackets, once we reach a certain budget level the choice truthfully becomes a lot clearer, and the fact of the matter is that NVidia currently owns the upper mid-range and beyond right now. Meaning, for a $1200 gaming PC build in 2019, you'll want to spend around $350 - $400 on your graphics card to maximize gaming performance, and in that category NVidia's new RTX 2060 is without a doubt the best buy. As for which particular model to get, in the $1000 gaming PC build we included the cheapest 2060 that we can still comfortably recommend, but with this build's slightly larger budget we can afford to include a high-end RTX model for the best cooling, lowest noise output, and the best looks (with RGB effects if that's your thing). Enter the Asus Rog Strix model, which is no question one of the best RTX 2060's you can get if you don't mind spending the extra 50 dollars on this superior model. It's also overclocked faster than other 2060 models, so the extra cost outlay for this high-end model is practical in a performance sense, although discerning readers will know that the price difference over cheaper 2060 cards doesn't justify the only-slight extra real-world performance gain that this OC model will provide. Overall though, we think it's worth the money as it's not just overclocked but will more efficiently cool the GPU with its high-quality triple fan setup, and keep noise to an absolute minimum. For a couple hands-on reviews of the card see our linked references at the bottom of this guide. As for what exact gaming performance you can expect from this fairly beastly GPU, see the aggregated benchmarks above for our estimations, but overall you'll get flawless 1080p 60FPS performance on ultra settings, and a very good 1440p frame rate which is the resolution this build is aimed for (unless you're doing 144Hz) as you could get away with a significantly cheaper GPU such as the RX 580 or older GTX 1060 for standard 1080p (as in, 1080p on 60-75Hz monitors). But yeah, for 1440p which is likely what most gamers would build this PC for, an RTX 2060 6GB is the perfect card and you really don't need a stronger video card such as the RTX 2070 (or GTX 1080) to get a flawless 60FPS in the majority of AAA games on high/ultra settings. 4K gaming is a stretch for the 2060, but you could absolutely get playable performance in 4K. Although a RTX 2070 or higher is going to provide a much better 4K experience and we wouldn't recommend a 2060 for 4K. As for virtual reality, which is really coming of age with 2019 being a very exciting year of possibility for the platform, a RTX 2060 is enough for decent performance in most VR games. You could say this $1200/1250 gaming PC build is a mid-range VR computer build. However, VR enthusiasts who want optimal performance with the Rift or Vive will want a better card like the RTX 2070 and above though. But this build will get you in the PC VR game without issues. MSI are well-known for producing some great value for money components, most notably motherboards, and their current crop of Z390 9th-gen Intel boards have a lot to offer. Specifically, their MSI MPG Z390 Gaming Plus model is a great fit for our needs here, and a solid quality value for money motherboard well-suited for a mid to high-end i5 gaming PC build like this. If you're an extreme overclocker you'll want to invest in a higher-end board (but if that's you you'll already know this), but for either keeping your 9600K CPU at stock speeds or running a mild to medium overclock, this board will serve you well and is easy to overclock as well. Aesthetically it does stand out from other boards in its price range, with a cool red and black design that's slightly aggressive but not too over the top, and will gel well with the rest of the components of this rig. At least we think so - once complete, this red and black gaming PC build (along with the included red LED fans) will look awesome. It doesn't have WiFi, so you'll want to get a external USB or internal PCIe adapter for wireless capability, or alternatively you can upgrade to a better motherboard such as the Gaming Edge AC edition from MSI once again. The ASUS ROG Strix Z390-H is also another suitable motherboard for this 9600K build that we can recommend as well, but overall the MSI (well, both the MSI boards we've listed) give better bang for buck in our eyes for this particular setup. For a high-end gaming build you may as well go for a fairly high speed set of memory modules such as 3000MHz or 3200MHz (assuming your motherboard supports this which our selected one does) because whilst the performance difference between 2400MHz, 2666Mhz, 3000Mhz and 3200Mhz (or even higher) won't make a noticeable difference when it comes to gaming, the price difference between 2400 and 3000 is not huge. Therefore, you might as well get 3000Mhz and be done with it, because in some cases it will make a slight difference overall (especially if you'll be doing demanding non-gaming stuff). But if you do find a great deal for 16GB of RAM at a slower speed, don't fret and feel free to include it instead of a super speedy 3000MHz kit if you want to cut costs on your high-end build. As for the amount of memory, which I logically should have mentioned first as it's much more important that speed when selecting the best memory for your gaming computer, 16GB is a no-brainer in this price tier and the ideal amount for high-end gaming. 8GB is the sweet spot in terms of value for builds under $800-$1000 or so, but 16GB makes a whole lot of sense for top-tier builds. Any more than 16 is overkill for gaming though, and 24 or 32GB is not going to make any difference whatsoever. Only reason to go higher than 16GB is for things like high-quality video editing, 3D rendering/animation, high-quality streaming of demanding games, and so on. Corsair Vengeance RAM is also very safe bet and hugely popular for a reason; great reliability and quality from a top memory manufacturer. Crucial, GSkill and Patriot are also great brands too. The particular model chosen for this month's best high-end gaming computer is the "LPX" version which is at a solid price and has a nice design that'll fit with your motherboard and overall build design nicely (although these modules will look great in pretty much any setup to be honest). They're also not huge sticks like some others which can interfere with larger CPU coolers etc, so they're versatile and will fit most setups without issues. When assembling a top-tier, powerful high-end gaming system you really want to get a high-quality power supply, and the 80-Plus Gold EVGA unit included in this setup is definitely that. EVGA produce some of the best value PSUs around these days, and the G3 unit we've picked is no exception. 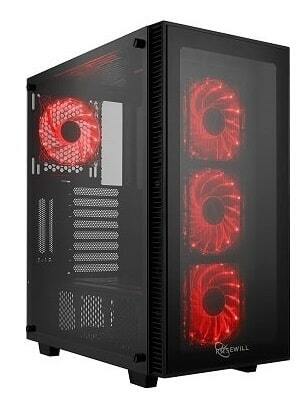 It's also a fully modular PSU which means less messy cabling and better cable management when it comes time to build. 650 watts, when coming from a reliable good-quality unit like the G3 EVGA, is actually plenty for a build like this packing fairly powerful parts like the RTX 2060 and 9600K, and still has room for most upgrades you could think including plenty of wiggle room for overclocking. As for storage, not much to say there except a 1TB standard 7200RPM HDD from Seagate, and a nicely sized well-priced SSD for super fast loading of your OS and other frequently used programs and games you put on there. Feel free to get a larger SSD if you value storage/loading speed and want to stack a whole heap of stuff on there. See our top value for money picks of the best mice, keyboards, screens, headsets, etc, in our peripheral buying guides (see the top menu) should you need to buy these new and you're not reusing old ones. These parts will all come down to personal preference, and of course how much more you have to spend on top of your core components. Option C: Buy Windows from Microsoft and download it to an existing computer/laptop, then put it on a flash drive, then use that flash drive when booting up your PC. Option D: Reuse your copy of Windows if your edition is eligible for this. See our top value for money picks of the best mice, keyboards, screens, headsets, etc, in our peripheral buying guides (see the top menu) should you need to buy these new and you're not reusing old parts. These parts will all come down to personal preference, and of course how much more you have to spend on top of your core components. 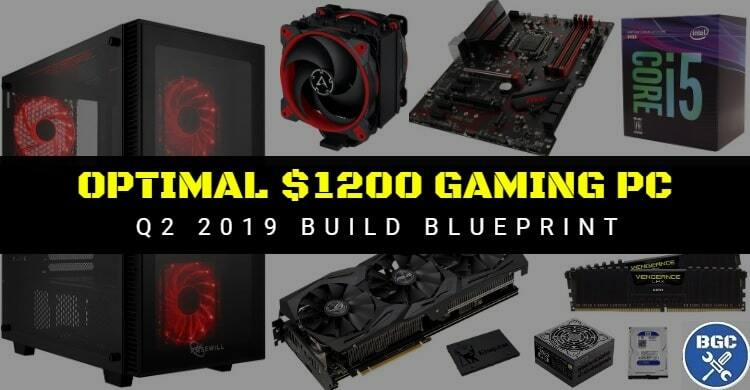 That wraps up this latest attempt of ours to plan the current best gaming PC build for $1200 based on our extensive objective rethink of the Q2 2019 market, along with a sprinkle of our own subjective opinion based on years designing optimal custom systems for gamers. We hope this build guide serves you well as-is or as a base for your ongoing build research. If you're putting together your first custom desktop, there's really nothing to fear as it really is as straightforward as they say, and simply a matter of following instructions and slowly taking one step at a time and making sure you follow a carefully-crated tutorial such as our own full installation guide on How to Build a PC Step by Step from Scratch (for those who prefer a written guide). Also see our first-time gaming PC builder's guide if you haven't already for more steps on planning your rig, as well as a link/s to our current favorite YouTube installation videos. 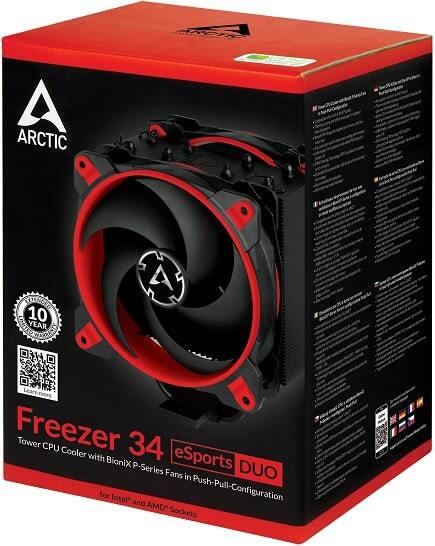 The Arctic Freezer 34 eSports Duo is one of the most straightforward coolers on the market to install; very beginner-friendly.